Based on several researches, the use of sedative-hypnotic drugs in child and adolescent patients are increasing. This study analyzed the prescription of sedative-hypnotic drugs at outpatient department of a psychiatric center for patients under 18 years old by medical orders database from the year 2005 to 2012. The purpose of this article was to investigate and analyze the trends of anxiolytics and sedative-hypnotics prescription for child and adolescent psychiatric patients in order to establish effective clinical guidelines and to ensure the medication safety. 1.Zoëga H, Baldursson G, Hrafnkelsson B, Almarsdottir AB, et al: Psychotropic Drug Use among Icelandic Children:A Nationwide Population-Based Study. Journal of child and adolescent psychopharmacology 2009;19(6):757-64. 3. 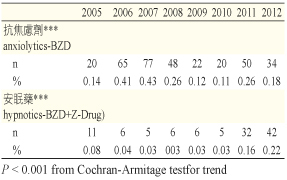 Yeh HH, Chen CY, Fang SY et al: Five-Year Trajectories of Long-Term Benzodiazepine Use by Adolescents: Patient, Provider, and Medication Factors. 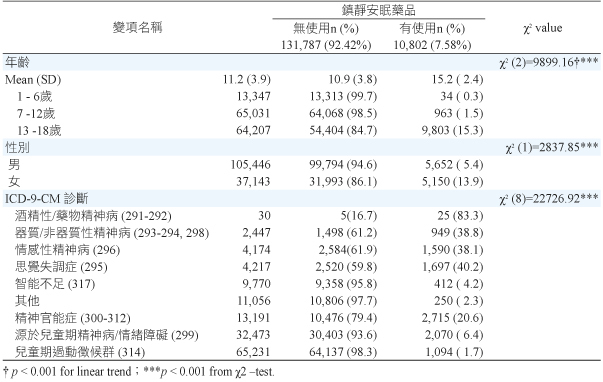 Psychiatric Services 2011; 62(8):900-7. 4. Quinn DM: Prevalence of psychoactive medication in children and adolescents. Can J Psychiatry. 1986; 31(6):575-80. 5. Koelch M, Prestel A, Singer H, Keller F, et al: Psychotropic Medication in Children and Adolescents in Germany: Prevalence, Indications, and Psychopathological Patterns. 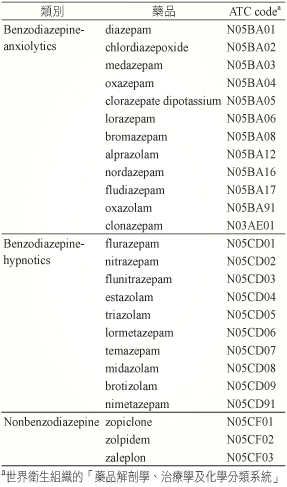 Journal of child and adolescent psychopharmacology 2009; 19(6):765-70. 6. Schirm E, Tobi H, de Jong-van den Berg LT: Risk factors for unlicensed and off-label drug use in children outside the hospital. Pediatrics 2003; 111:291-5. 7. Meltzer LJ, Mindell JA, Owens JA, Byars KC. Use of sleep medications in hospitalized pediatric patients. Pediatrics 2007; 119:1047-55. 8. Stojanovski SD, Rasu RS, Balkrishnan R, Nahata MC. Trends in medication prescribing for pediatric sleep difficulties in US outpatient settings. Sleep 2007; 30:1013-17.